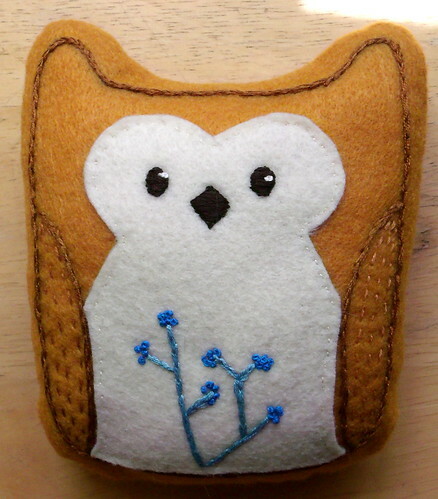 I finished stuffing and sewing the stuffing opening closed on the doodle stitch owl at my knitting group yesterday — yay! I decided to go with some berry-ish clusters of French knots in the embroidered motif instead of little satin stitch circles. I completely chickened out of trying the tiny circles in satin stitch, but I also think the French knots look pretty cool. I had initially had this grand slow-crafting vision of hand-stitching the whole thing, including hand-sewing the front and back together. After I finished the embroidery and applique parts and cut out the two main pieces, I got maybe an inch into that seam before I tested the it and decided that my hand-stitching ability isn’t yet up to backstitching a strong enough seam to withstand a 2½-year-old. I’ve been doing pretty well whipstitching hexagons together for the hexagon flower quilt, so I thought it would work out. But either I don’t have enough practice backstitching tightly yet or maybe it was that it was through two layers of felt that was doing me in. Either way, I decided that in this case machine stitching it was the infinitely saner choice. 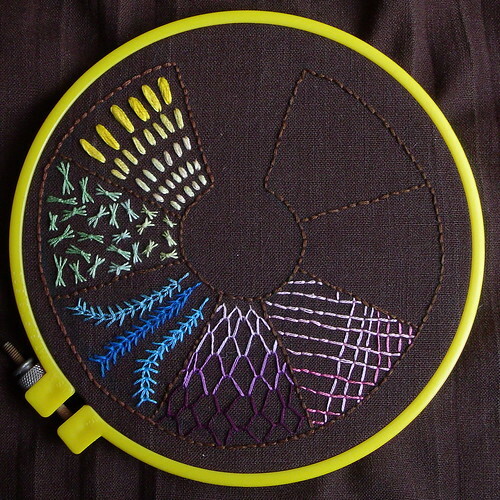 At the moment I’m also working on my embroidery samplers. The June sampler-along one is coming along, but I’ve had a little setback. I tried to do this backstitch trellis thing (the pink section below) and it looks like a drunken monkey got hold of my sampler and had a go at it. I’m going to rip that out and try something less geometric-looking and save the ones that require precise spacing for when I do one on even-weave cloth. The purple is wave filling stitch, and it came out okay I think, though my choice for the darker purple was maybe a little questionable since it blends in with the dark background. I don’t have a lot of purples, turns out, and a lot of them are sort of muted/grayed shades. So I chose this one as being more saturated than some of the other ones I have, and it turned out a bit dark. Last night I cut out a bunch of pieces of fabric for samplers and zig-zagged around the edges with the sewing machine so they’ll be ready to go as I need them. I’m also starting a new piece for the TAST sampler. I started the first one without giving it much thought and just did straight and curved lines for the most part, and I’d like to start doing something a little more visually interesting. The first one is also almost bigger than what I’ve decided I want them to be — I’m planning on eventually making a fabric book out of embroidery samplers when I have a whole pile of them finished. For my second TAST sampler I’m using the garden path sampler template from &Stitches, and for some of the other ones I’ll probably do things like make a bunch of random curved sections and fill them, maybe do some sort of Mondrian-esque thing with straight lines and rectangles for a few of them.